Tix is available on the iPhone, iPod touch, and iPad for $1.99. Here we have a strategy board game where you push squares around on a board. Each time you set a square, it is placed in an angle. You can then slide your square to rotate the angled squares and set them as square again. When a player runs out of moves, they lose. Tix is developed by Martijn Althuizen and review of Tix was done on an iPhone 3GS. Simple board games like Tix make reviews difficult. These kinds of games are based on long established classic games on a digital platform. Essentially, Tix is a mix of chess and tic-tac-toe. Imagine all your pieces are Rooks and that you are placing them on the chess field anywhere you’d like. Position it in a vulnerable area and your opponent will capture it. You can slide your block in any direction a turn after you set it, so timing, positioning, and baiting are all part of the strategy, like a more complex version of tic-tac-toe. 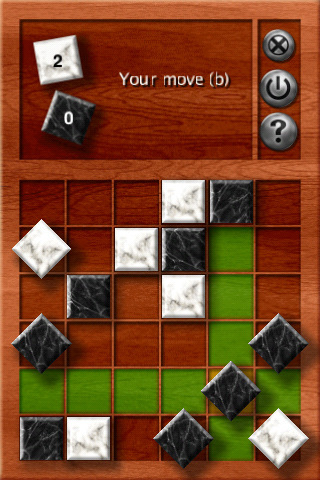 To play, you tap the area with the black and white square counters, which highlight the field in green. Then you tap on any space available to you and set down your colored square. Would have loved to see the area labeled “Tap here to place Square” or something so I wouldn’t have had to randomly tap all around the screen in confused frustration during my first game. The AI for the game is functionally challenging and smart placement becomes very important. The game uses a rather mediocre user interface. The menu is a text screen where the ‘buttons’ are just words. It’s unappealing and… blue… but functional. Buttons are preferred however, like a website, so your eye can quickly decipher one element from the other. 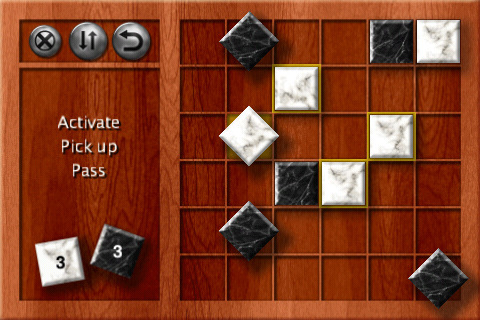 The art in-game is ok. You have a wooden board and the squares appear as marble. Clean and simple but limited. Games like these kind of need customizable selections of skins to keep the visual appeal high. Chess games have different chess boards, so why not different textures and pieces for Tix? Tix is an app that works and functions perfectly fine. The art is lacking and the learning curve can be frustrating at times, but I could say the same about chess. It’s a fine game that you can play with a friend (through one device) or against the CPU in a line, waiting for your friends, or in the back of the car on a road trip. AppSafari review of Tix by Martijn Althuizen was written by Joseph Ho on June 10th, 2011 and categorized under App Store, Board, Games, Strategy. Page viewed 3592 times, 9 so far today. Need help on using these apps? Please read the Help Page.